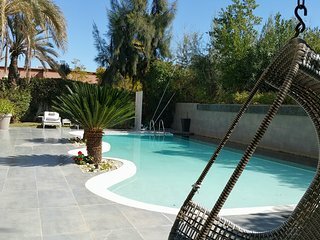 LE RIAD KADA KADA VOTRE MAISON À MARRAKECH ! 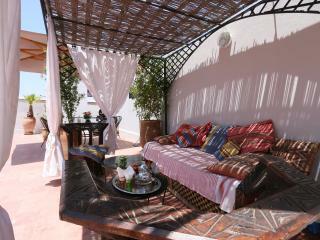 Excellent, traditional Riad within the Medina. 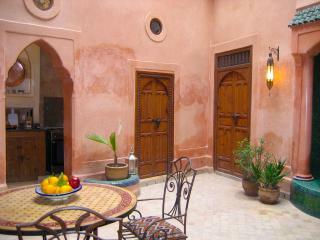 Experience Medina life in beautifully decorated Riad cared for by caring housekeeper. 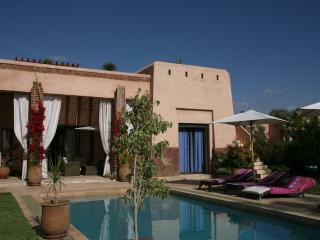 The Riad looked better than the pictures. 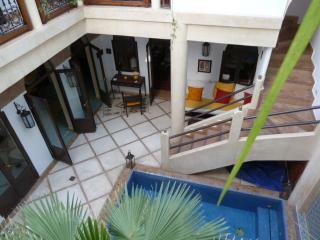 We loved the outside space on the top level. We also felt safe inside the secured space. 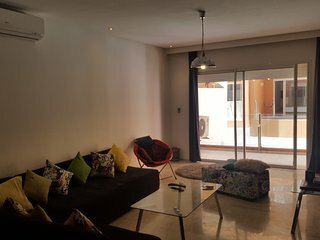 This is a lovely place to stay and the hosts are great. 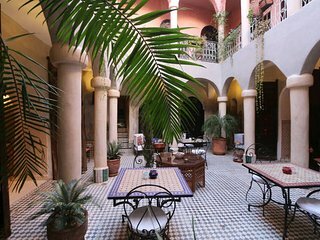 It is somewhat difficult to find but the location is perfect for seeing the Saadian Tombs and the Badi Palace.It is several house from a popular cafe. 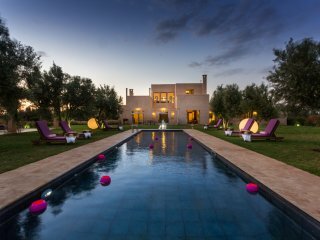 We really spoiled ourselves at Villa Olives! 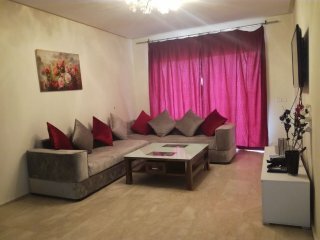 Very pretty and spacious villa..
Appartement Gueliz Centre ville-Wifi gratuit. 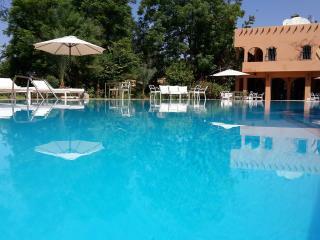 Nothing short of OUTSTANDING.Khadja was/is fabulous and Mostapha was a gracious house manager. 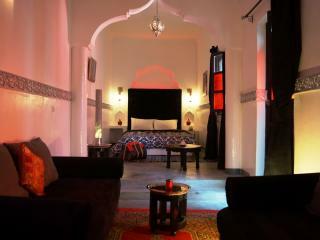 We had an outstanding visit in a lovely riad. Thank you Philippe! 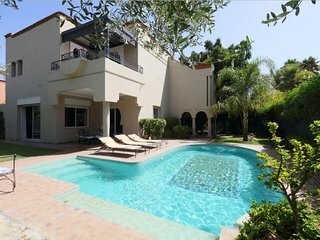 Rooms clean and comfortable - exceptionally helpful, friendly and kind staff. 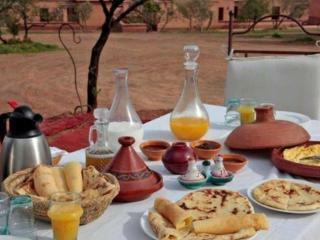 Delicious breakfast taken on the roof - fantastic location. 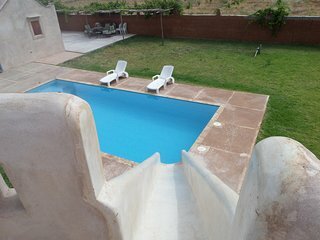 traditional house marrakech / WIFI gratuit. 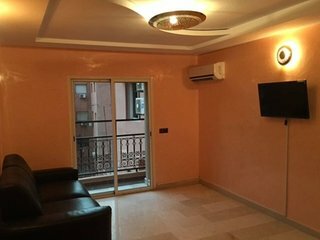 Traditional apartment. Just as described. 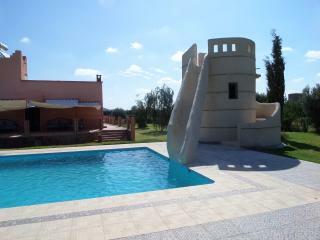 Location is amazing, only 5 minute walk from Gueliz plaza/Mcdonalds. 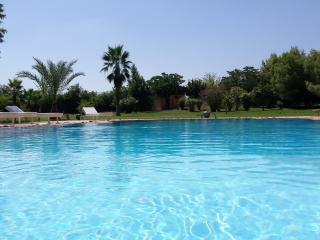 Beautiful, relaxing, hospitable, highly recommend Apple Gardens Villas! 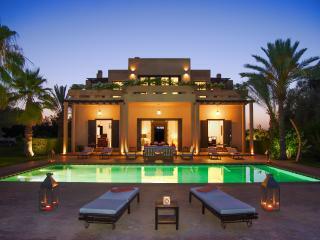 Wonderful relaxing villa after the glorious noise and sensations of Marrakesh. 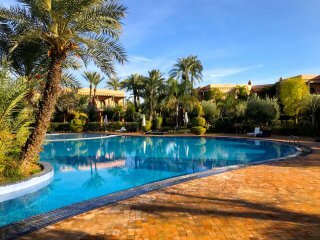 Framed by the distant Atlas Mountains and filled with prayer calls from minarets and mosques, a Marrakech escape beckons. 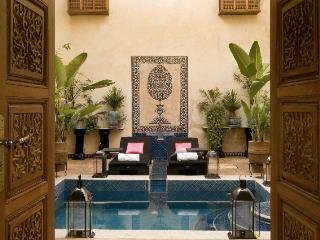 Walk narrow streets and bustling medina alleyways lined with ornate carved wooden doors leading past souks and shops. 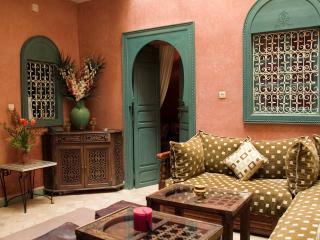 Succumb to the charms of tea-sipping merchants hawking woolen rugs, silver, leather, and handicrafts of every sort. 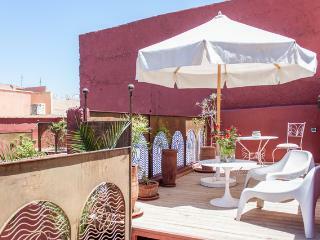 Relax from the medina hustle and bustle on the rooftop terrace of your money-saving Marrakech holiday rental riad, sipping soothing mint tea and watching the world below go by as the Atlas Mountains change colour. A head-spinning cacophony of sights, sounds, and smells surrounded by the souks and shops of the medina, Jemaa el-Fna is a large central plaza gone mad. 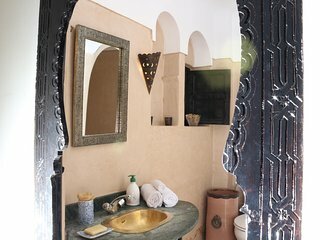 During the day, Jemaa el-Fna crawls with monkeys, snake charmers, colorful dancers, magicians, story-tellers, medicine and spice peddlers, water sellers with leather water-bags and brass cups, and vendors hawking everything and anything. 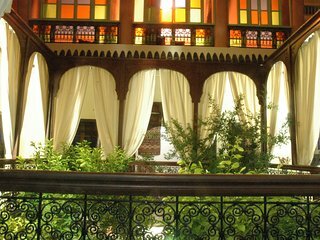 Nighttime, food stalls light up Jemaa el-Fna and the aromas of grilled seafood, eggplant, olives, breads, and salads is hard to resist. 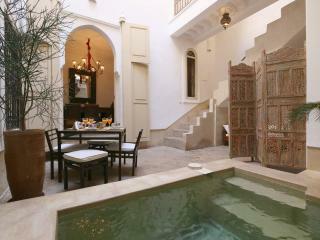 There is no escape, as all paths lead back into the medina. 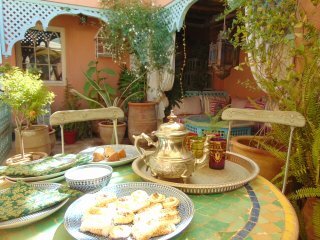 Your money-saving Marrakech holiday rental riad, villa, home, apartment, or guest room is your mint-tea oasis of tranquility and calm. 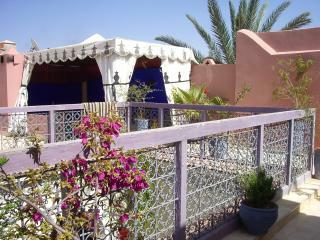 Near Jemaa el-Fna, view the Koutoubia Mosque gardens and Almoravid Palace ruins. 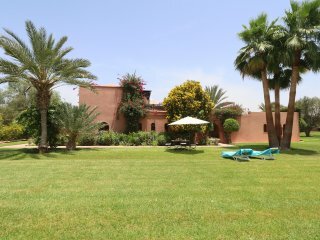 Menara Gardens date back to the 12th century. 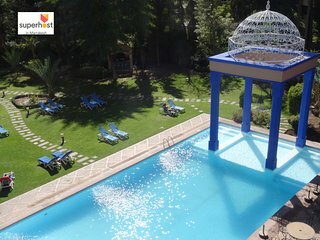 Jardin Majorelle explodes with cacti, desert colours, and pools of goldfish, a colorful vision reflecting landscape painter Majorelle and fashion designer Yves Saint Laurent. 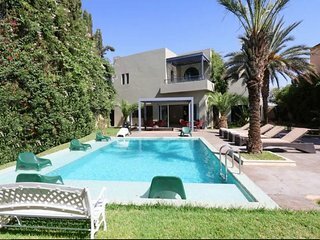 The blue villa houses Majorelle’s Moroccan lithographs and part of Laurent’s art collection in what is called the Museum of Islamic Arts. 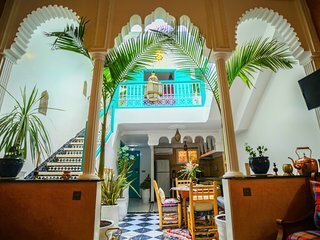 The three floors of Maison de la Photographie house a photographic history of pre-1950 Marrakech, and a rooftop-view terrace cafe with colorful cushions and rugs. 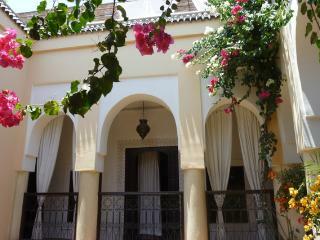 The Musee de Marrakech in Mnebhi Palace has tiled architecture, a relaxing inner courtyard, and varied exhibits. 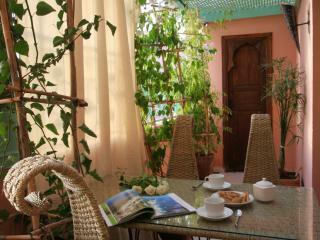 Maison Tiskiwin will educate the family, with a room devoted to each region of the country. 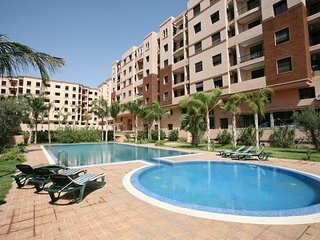 Dar Si Said features regional arts. 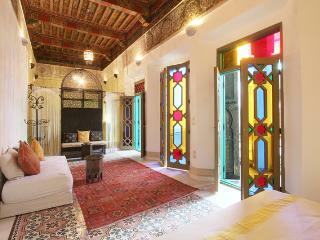 Dar Bellarj spotlights Moroccan arts and culture. 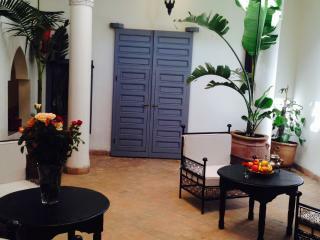 The new Art of Living Museum looks at life styles and culture, and has a rooftop garden. 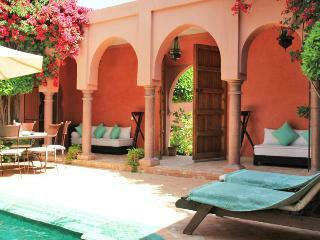 Marrakech is deeply layered with palaces, history, restaurants, and sights. 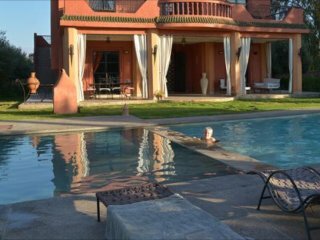 Your Marrakech holiday rental riad, villa, home, apartment, or guest room hosts can help your family balance relaxation and sightseeing choices. 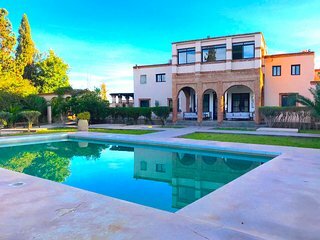 Plus the money-savings from choosing a Marrakech holiday rental over a luxury hotel can help pay for dining out, medina shopping, golf, horseback riding, camel rides, bicycling, hot air ballooning, hammam massages, smoking shisha from a hookah, and day trips.